Spurred in part by Cash for Clunkers, the consumer went shopping again. 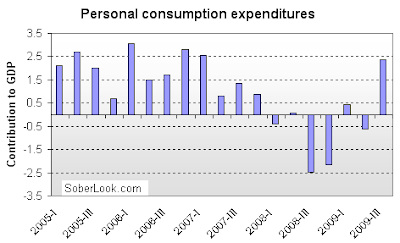 Personal consumption increase was 67% of the jump in the GDP number announced this morning (42% came from durable goods). Some other areas showed improvements as well. Residential construction was up 23%, driven to some extent by the first-time home buyers tax incentive. It contributed another 0.53% to the GDP increase. There are clear fingerprints of government support in these GDP numbers. When the support programs are withdrawn and taxes (state and federal) increase, it's questionable whether this rate is sustainable going forward.